Abe Lincoln, 80 days, indeterminate, to 1 lb., regular leaf, fresh (salad or slicing)/canning New! Good processing tomato. Our friend from whom we got the seeds for this variety says, "If you could only grow one tomato, this is the one you should grow! They're beautiful, delicious, and highly prolific, just about the only perfect tomato there is. This is what a tomato is supposed to be!" Thick-walled fruits are bright scarlet and very meaty. Excellent disease resistance. Developed for Western growers but does well all over the country. Amish Paste, 82-85 days, indeterminate, 4-8 oz., regular leaf, fresh/sauce/paste/drying New! Acorn-shaped. Great for canning or making sauce or paste. Also good in a salad. This cute tomato plant could be grown in a container. Named for the appearance of the plants which have grayish-white fuzzy foliage. Smooth, very firm fruits have mild flavor. Aurora, 65-75 days, indeterminate, 2-8 oz., slicer New! Very flavorful tomato. Wonderful producer. A popular old standard variety, deep red and very large; fine flavor, rich old-time tomato taste. Big Italian Plum, 85 days, indeterminate, 2"-5", canning/sauce/paste New! Large, dryish, pepper-shaped tomato with few seeds and good flavor. Good canner and for sauce. Big Zac, 90 days, indeterminate, to 3 lbs.+, regular leaf, slicing New! This good-flavored, meaty tomato won the Week's Giant Growers Contest in 1998. Very vigorous and disease resistant. Bloody Butcher (OP), 65 days, indeterminate, 2-3 oz. New! Very productive plants produce clusters of round tomatoes with greenish shoulders. Great if you have a short growing season. Loaded with seeds. Box Car Willie, 80 days, indeterminate, 6-10 oz., regular leaf, slicing/drying New! Smooth red fruit with a delicious flavor. Round globes won't crack; disease resistant. A large, all-purpose heirloom known to sail through a long, dry spell with no slowing down. Break O'Day, 80-84 days, indeterminate, 7 oz., regular leaf, slicing/canning New! A high-producing heirloom that was introduced in 1931. Flame-red, smooth globe-shaped fruit that are very uniform and beautiful, perfect for marketing. Heirloom tomato expert Dr. Carolyn Male calls this "A workhorse of a tomato," and it truly is! The flavor is rich and tangy, perfect for canning. Cherry, 75 days, indeterminate, ½"-1", cherry New! Very productive, tasty cherry tomato. Christmas Grapes, 75 days, indeterminate, 1½-2 oz., cherry New! Bright scarlet-red grape-type tomatoes, very sweet and strong flavor. Highly productive. Cold Set, 65 days, determinate, 3"-4", medium size, regular leaf, salad New! Open pollinated. Easy to grow; tolerates light frost. Ripens a couple of weeks earlier than most tomatoes. Excellent yield of flavorful fruits. This giant of French heirlooms is also big in flavor; it has an intense, sweet taste. The huge vines set on very heavily and yield well in many climates. Delicious, 77 days, indeterminate, 1 lb.+, regular leaf, beefsteak/slicing New! Holds the world's record for largest tomato. If you want to grow a whopper of a tomato, you'll have to remove most of the fruit, so all the plant's resources go into each one. Great all-purpose tomato. A standard tomato producing early, medium-sized, bright-red fruit with good flavor. Early Rouge, 85-89 days, determinate, 3½"-4", fresh/cooking New! Medium-sized, red, round; good for salads or cooking. Fireball, 75 days, determinate, 4 oz., regular leaf, fresh (salad or slicing) New! Very productive, has been a commercial variety for many years. Fireworks II, 50-55 days, determinate, 4-8 oz., all-purpose New! Intensely red all-purpose tomato with a mild, sweet taste. Vigorous plants produce abundant clusters of 6-12 bright red, extra-sweet, bite-size fruits all summer. Great for eating whole as snacks or in salads. Legend, OP, 75-80 days, determinate, 4"-5", regular leaf, fresh (salad or slicing) New! At last a very early, large-fruited tomato that has good resistance to late blight, a disease that makes it hard to produce tomatoes in some areas. The fruit are bright red, uniformly round and smooth; the flavor is sweet and rich for an early tomato. A great tomato for greenhouse production as they set heavy yields at cool temperatures; great for marketing. Developed by Dr. Baggett, OSU. This variety has very few seeds. Long-Keeper, 78 days, semi-determinate, 4-7 oz., storage New! Unblemished tomatoes are harvested before frost and allowed to ripen at room temperature. Fruits are mature for harvest when they have a pale, pink blush. Store at room temperature so fruits are not touching and check for ripeness and rotting weekly. 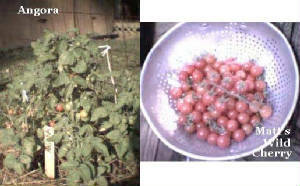 Fruits become ripe 1½ to 3 months after harvest, ensuring a supply of fresh tomatoes into the winter. Fruits ripen in storage to a satiny, red-orange color. Flesh ripens to medium-red. Best planted in late spring or early summer for fall harvest. A most unique novelty--this tomato has pale yellowish plants, and the unripe fruit are also yellow! Flowers are creamy-white instead of yellow. The fruit ripens from yellow to orange to red; flavor and yields are good, making this tomato perfect for the home gardener who wants something unusual. This may be the same tomato A. W. Livingston Seed Co. introduced in 1898 under the name "Honor Bright." Rare! Market Miracle, 65 days, determinate, 8-12 oz., slicer New! Beautiful to look at. Acidic flavor, a good addition to spaghetti sauce. Matt's Wild Cherry, 60 days, indeterminate, ¼"-½", cherry New! Very, very sweet and deliciously fruity and flavorful. Excellent yield, a favorite! A wild tomato from Mexico. Montreal Tasty, 75-80 days, indeterminate, 4 oz.+ New! Excellent flavor; very productive. Old Canadian variety. See next page for more Red Tomatoes.